When trying to fight senior memory loss for Massachusetts residents it can sometimes feel like a loosing battle. For some it is simple forgetfulness while for others there are major diseases that cause short and long term memory loss issues. There are some simple gadgets that will help problems related to senior memory loss. Today, close to 5 million U.S. residents are living with severe memory loss, but by 2050 some estimates show it climbing to 14 million. The vast majority will prefer to live at home as long as family, finances and ability allow. Today’s assistance and safety gadgets go beyond the classic wheelchairs and special toilet seats, offering easy-to-use tech solutions. We found these 6 especially clever gadgets (and one over $50) for use in the home by elderly persons with compromised vision and hearing, or mild to moderate memory impairment. Large Display Digital Alarm Clock. One simple memory test some doctors use to detect memory issues is the “clock test”. They ask the patient to draw a simple clock face that shows 3:45. As Alzheimer’s progresses it becomes hard or impossible to read an analog clock. 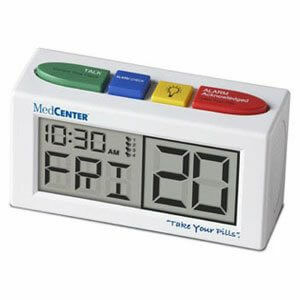 Having a large display digital clock will help with senior memory loss. Large format phone with speed-dial presets. Remembering or looking up phone numbers, even those posted in “obvious places” becomes a real challenge. To continue living at home before they need round-the-clock care, your aging parent needs to be able to call you without outside assistance. Talking Medication Alarm Clock. This ingenious little gadget allows you to set the clock up to four times a day with friendly voice reminders. For a forgetful senior, talking medication reminders can mean staying on track with blood pressure, diabetes and other time- and dose-critical medications. A must to fight senior memory loss! Digital Photo Frames. To keep recent memories current and fresh, utilizing a digital photo frame that can rotate hundreds of pictures from a memory card is a great inexpensive way to fight senior memory loss. It allows the senior a convenient way to browse recent pictures of people currently in their life. A GPS tracking bracelet is a great gadget to use if your parent has Alzheimer’s disease and you’re worried about them wandering off and getting lost. A transponder on the GPS bracelet allows a service to track him or her down remotely, and notify you or local police. A monthly service fee is required to use the GPS tracking bracelets for this purpose. Cook-stove temperature control: This is over $50 but a terrific safety tool for senior independent living: . Kitchen fires occur every 8 minutes in the United States. Safe-T-element has come up with an ingenious stove-top device, electronic plates that sit over existing burners and automatically shuts the burner off when the temperature gets too hot. Baby Monitors: This is helps fight senior memory loss but providing a way for a loved one that lives and/or cares for a senior to monitor them without being in each room with them every moment of the day. By using this you know what is happening in a room without being there. These are just a few ideas on making activities of daily living easier and safer when fighting memory loss with seniors. There are plenty of other devices out there that can help with to fight senior memory loss. What devices and technologies do you use to fight senior memory loss with your loved ones?